Don’t settle for processed and packaged snacks that work against you—fuel your body with these vegetarian snacks that work for you with the best nutrients to keep you full and fabulous even when you’re feeling snackish. You’ll need a little patience to make these kale chips, but I promise you it’s worth the wait. Packed with vitamin C and coated with spices and healthy fats, these chips are cooked at a low temperature to maintain the integrity of the nutrients. Kale chips are best enjoyed that day. Once completely cooled, they are good in a sealed container for about 5 days. Preheat oven to 170 (or as low as it will set).Prep your organic kale by washing thoroughly and lay out to dry.Prepare the dressing for your kale chips: blend drained cashews, bell pepper, garlic, chipotle powder, cumin, aminos, olive oil, and lemon in a blender or Vitamix.Pour mixture over kale in bowl and toss until every chip is well coated.Place chips on parchment lined baking sheets, making sure that they are not touching or overlapping.Bake for 2–3 hours until dry and crunchy. After 1 hour, flip the chips and check periodically for crunchy-ness. When they are completely dry, you’re ready to snack! Low glycemic, healthy fat and totally crunch-worthy, sweet potato chips are in a category of their own. Pair with honey mustard for sensational dipping! The trick to getting your sweet potato chips to be crispy is to wash the yam one day before (if you’re planning on leaving the skin on) and letting them dry thoroughly. Otherwise, skinning it dry will work just as well. Brush lightly with olive oil and sprinkle with sea salt. For a sweeter treat, sprinkle with organic stevia and cinnamon. Bake for approximately 20 minutes or until desired texture is reached. Flip your chips at the 10 minute mark. Transfer to a cooling rack and enjoy the same day. Eaten with a spoon, tastes like a dessert, and is totally guilt-free! 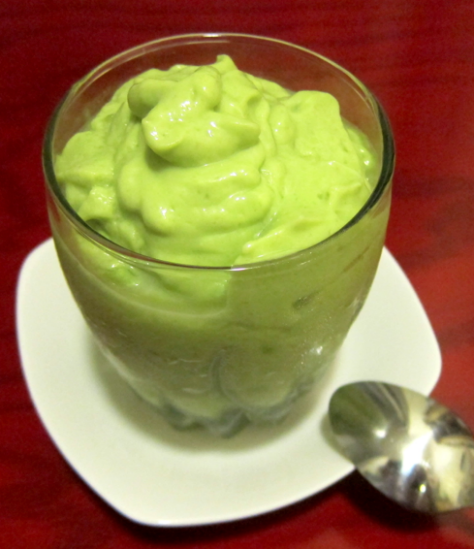 This pudding is a great snack for raw foodies and anyone on a juice cleanse or on a high protein, high fat diet.